The opening scene served as a reminder of the terms and conditions of an Indian show: terrible acting, awful humour and no chance of a refund. Anyone who hadn’t bought into this ethos was encouraged to head for the exits! Unsurprisingly, a plethora of the songs and music is penned by The Mozart of Madras, the inimitable and world famous Oscar winner A.R. Rahman. 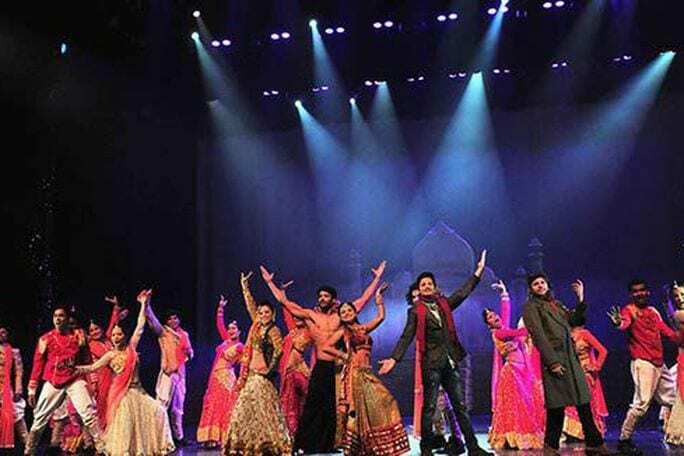 The chants of his iconic song Jai Ho from the movie Slum Dog Millionaire resonated around the theatre that heralded a dramatic start to the evening. The opening dance to the song Deewani Mastani was a grand ode to the opulence of the Royal Court dancers of historical India as depicted in the film Bajirao Mastani. The dancers performed with exuberance and perfection to songs like Balam Piche Kare (a Holi festival song from the super hit film Yeh Jawaani Hai Deewani) that captured the essence of youth and joy. The dancers switched effortlessly from classic dancing to the more peppy beats of “Hamma” from Dil Se. The costumes were a fabulous and dazzling tribute to the painstaking attention to detail that is the hallmark of Bollywood designers and choreographers. From lehengas, sarees to hot pants and lycra vests the metamorphosis was unbelievably magical. The live musicians on stage like Flash on the electric guitar and Shankar on the drums engaged with an expectant and vibrant audience who were feeling in discotheque mood. The importance of Yoga in Indian culture is demonstrated with a unique ‘nose’ exercise. Although the musical did not feature A.R. Rahman the essence of Rahman was intertwined in the songs and dances. The viewer is transported into a make believe world of love, romance, fear and everlasting hope of a life of musical fantasy. A must see for Bollywood lovers and if you are not a Bollywood fan you will certainly be converted to one. A unique twist results in Jeremy Corbyn also getting a shout out.